Oat flakes*, wheat flakes*, 3-fruit flakes* (wholegrain wheat flour*, date juice concentrate*, apple juice concentrate*, banana purée*), sultanas* 6% (sultanas* 99,5%, sunflower oil*), chopped figs* (figs* 97%, rice flour*), apple cubes*, apple flakes* (apple purée*, rice flour*, apple juice concentrate*), hazelnuts*, chopped and roasted almonds*. May contain traces of lupines, sesame seeds, soy and other nuts. 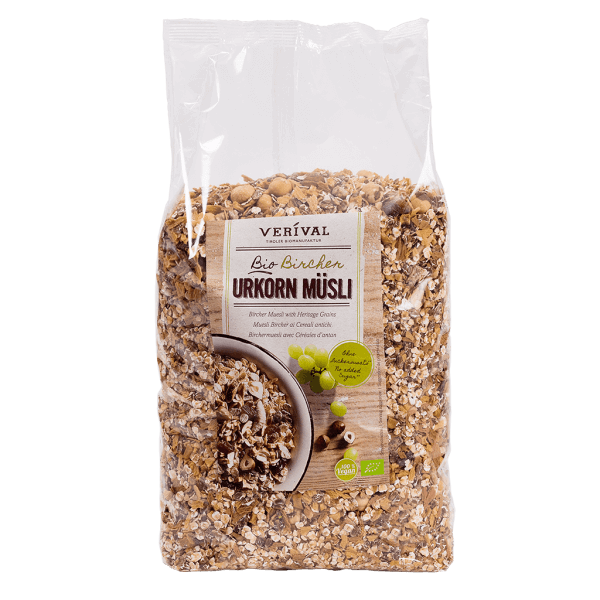 Our Bircher Muesli is the ideal basis for creative muesli ideas.